vaughn03, I have been waiting like a lot of other to see what your next draft is going to be like. Like a lot of posts in your thread, I love this map. Please please post something soon and put me out of my misery. Sorry was off diving. Will work on this over Thanksgiving - should have a post. Thanks. Regarding size - When I helped on the Mississippi map size became a big issue and the project was abandoned because creator could not get Super Size approval. vaughn, regarding the size, use this as a rule of thumb. If you can justify every single pixel over the 840/800, then it can be done. What I mean is, pretty graphics will not be allowed (like the border around the map, you might be asked to reduce the thickness of it) but something that allows the gameplay and players experience to be clearer will be. Right now, the spice islands are very large so you might be asked to shrink them. The mini map is also large, so that could be made smaller. But the text needs to go bigger so it can be read. This all gives you wiggle room to play with. Mississippi could not justify this. That was the reason behind that. OK - Thanks - will follow those suggestions. Think I will push it out to 880-900 make the large map bigger - make the smaller maps smaller and better proportioned. Will fix text - I'll set it at size and change fonts. 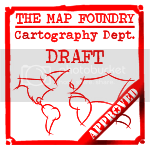 Let me put it this way vaughn, rarely does nobodies post in the drafting room, that is how much he regards your map. You have got a lot of support for this one and we will try to help in any way we can. Shoot man! You have the talent. I wish my first draft looked that good. I cant wait to see future drafts. As far as playability - I think it will work but I may have missed something. Sure it will need adjustments. Think I would rather not have the 'troop landing dots' Fractured China map doesn't and seems better for it, to me. Maybe should clean-up arrows? Straighter lines - maybe lines instead of dots? This looks friggin phenomenal vaughn. vaughn, sticky for now, stamp in a couple of days. Let me say that this is a very nice map and whilst some of the changes you have made seem to be going in the wrong direction (coloured lines) I can appreciate what you are trying to do for the players. When you post new maps can you keep the old ones up there so we can compare. Ty. gh is right. Bung the old drafts into spoiler tags. Another thing, can you post the map on the most recent page. What's a 'spoiler tag'..? I'm sorry I appear to be really dense when it comes to forums, this is really my first one... I'm trying to get it right. Thanks for your patience. I'll fix the 'colored lines' and repost later this afternoon with all my previous posted versions. I'll use black with dots and dashes and lines and arrows and what-not. I get that now... I almost changed these anyways - but I was still going to use color... Going to make them more direct, not wandering as they are a little bit now... If you have anything else that's a MUST - let me know if you have time. vaughn03 wrote: What's a 'spoiler tag'..? I'm sorry I appear to be really dense when it comes to forums, this is really my first one... I'm trying to get it right. Thanks for your patience. As for supersized, as of right now we are not allowing them, on the flip side if a map really needs some extra room within reason then thenobodies80 and myself will discuss it and let you know. So before you go and make you map that size, let me look at it and see what can be done to get everything to fit within the current large size of 840x800. Here we go - I started out keeping to the 840 x 800. Then Cartographers told me I should look to go extra - admittedly I went for the full 1200... Now it's not in 840 x 800 proportions any more - changing that is a LOT harder than changing the attack lines... Worse case that would be 876 wide x 800... I think bigger is much better for this map because of the small straights and the graphic elements. Don't understand with 2 sizes why they are so close together in size..? Makes more sense to me to have a big at - 1314 x 1200 (In my case) and then size the small to like 657 x 600 pixels for people playing on tablets/phones. No? Anyways let me know - thanks. even if it means have a few pixels more than the limits of width. So he did say, going slightly wider would be OK, if you needed it. When I clarified this for you, I did explain that with the size of the map you will have to justify all pixels. You posted that you would like the size to go up to 880-900. I miss read that as 800/900. What I believed to be nobodies guide for you. Wider, not taller. My mistake and I apologise to you for this. Your current draft though is 1024/935. At this size, I doubt you will be able to. Not only is this taller, but also a lot wider than what you had posted. Get the map down as much as you can but 800 in height is what you are looking for as a max. Do not worry about the width so much. But if you can get that to the 900 like you said, then all good IMO. Nice map! Question about ports; those auto deploy or troops deploy? With the larger size you could rearrange the map a bit too. I think Ports 'Auto-deploy' and Sea Passages 'Decay'. I need to have that in Legend. I think I need an attack line with 'Maynila' and 'SP1' as well so Central can get to sea. There's either an extra troop landing or I need a border in Malaka. That's what I've seen so far. Waiting for feedback and further instructions from the Cartographers. Another quickie, the legend says that Spice Island Fleet +1 with Spice & Portal to Spice Island. What or where is the Portal? That's probably not so clear, eh..? The intent is that you have to go thru the 'small fleet' on the big map to be on the 'Spice Island Fleet' on the small inset map on the bottom right. I'll have to fix that as well. vaughn, just checked the size and 900 width and 800 height for me is good as I believe it fits in with what nobodies said. Not too large but large enough. What you will find though, is you will be looked at by the graphics people (thenobodies80, isaiah40 and RedBaron0) and if they see a way to shrink the map, they will ask you to do it. But apart from that, good luck in the main foundry. Game play and graphics. Thanks Koontz. I'll shrink it if they ask but it's better bigger... They just trying to hold the 'data' down..? Data is not really the important thing with size. I think that now more and more are playing on phones and tablets. For those people size does count. Also, a lot of monitors only really fit the small map in. I know that is the reason for me only playing on the small map, even on my laptop where the large map fits better.